A Flood Control System is the most common way of preventing the city sewer from backing up and flooding your basement. Call us for a free onsite estimate to best understand how the system works and where it can be installed at your property. The picture above is a basic diagram of our Flood Control System. We install (1) or (2) backwater valves which prevents water from coming back into your basement. The valve can open to allow water to drain from your house, but will close if there is any back pressure in the line. We also install a pump to allow you to still use all your water and drains in the building. In the case that the valve is closed, the water spills into a pit and is pushed out passed the valve by a 2" Ejector Pump. 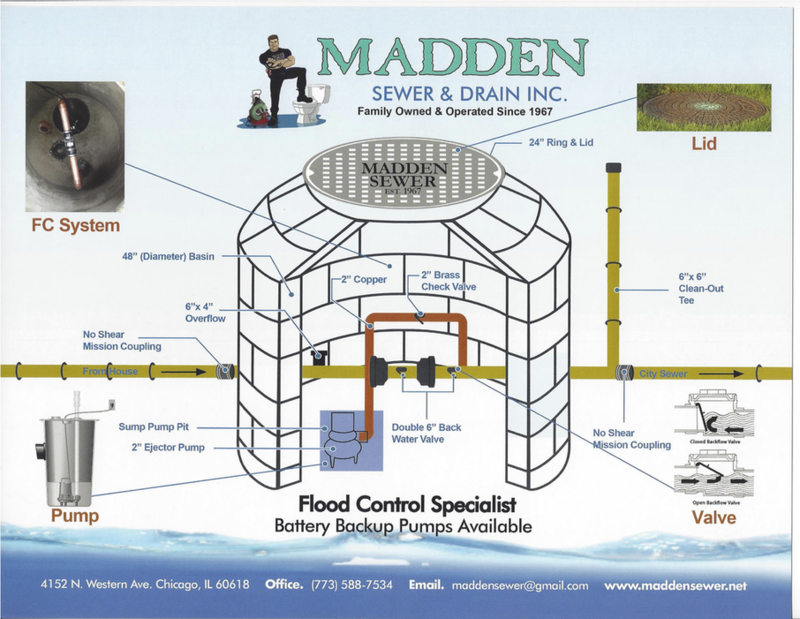 Once the system is installed, Madden Sewer installs a basin and lid for future access. Most systems are installed outside in the front yard, but can also be installed inside.